The Bruce Springsteen of Dentistry | Robert S. Minch, D.D.S., P.A. As I have evolved over my 32 years of practice, I have been continually energized and professionally excited by learning new techniques to make a patient’s smile beautiful and natural looking. Additionally, teaching dentistry, whether it is to the dental residents at Johns Hopkins Hospital or dentists from around the country at Spear Education in Scottsdale, AZ (www.speareducation.com) where I have been a Visiting Faculty member since 2009, continues to feed my passion for dentistry. Dr. L D Pankey who started the Pankey Institute (www.pankeyinstitute.org) in Key Biscayne Florida back in 1973 taught that a Master Dentist is one who , not only practices excellent dentistry, but also teaches and writes on the subject. I have found that following “Master Dentists” from around the world has lifted my skills and understanding immeasurably . As readers of my Blog remember, I have traveled to Brazil twice to learn from Dr. Newton Fahl, an internationally known dentist who is the best at creating beautiful smiles utilizing dental bonding. I like to describe him as the Bruce Springsteen of Dentistry because, in the dental world, he is a rock star! This is a skill that improves with much practice and utilizes artistry, craftsmanship and a working knowledge of state of the art dental materials and their optical properties. I went down to learn with Dr. Fahl TWICE because the information changes rapidly as the materials and techniques continually improve. But after traveling down to Curitiba, Brazil twice I realized that it would be so much more efficient and interesting to bring him up to Baltimore and learn out of my office. 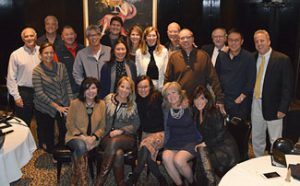 I then found 15 like minded dentists from around the country who were similarly committed to providing the absolute best dentistry possible as well as willing to take time out of their schedule and pay the larger than usual meeting fee to learn with Dr. Fahl. After 3 years of planning and logistics, the meeting finally took place this past month- November 3-6th. I must say that the course went off without a hitch; the level of learning was amazing while the camaraderie and sharing among the students was very inspiring. And having Dr. Fahl in Baltimore, at Green Spring Station, for four days was a once in a lifetime experience. He couldn’t have been more gracious while being intent on having us perfect his techniques. What a special event! And from this event I took away 2 truths. Firstly, I love being a dentist- more specifically, I love being a dentist practicing at the top of my game. To continually learn new techniques and refine the skills that I already have is what it’s all about. To be able to use cosmetic bonding material to create a natural looking, radiant smile takes an artistic eye and lots and lots of practice. But the final payoff is when I see the excitement and emotion in my patient’s eyes when they see their new smile in the mirror for the first time- a true “Wow” experience! And the second truth that I took away from the Dr. Newton Fahl meeting last month is that I sincerely enjoy creating awesome experiences for other people. Whether it is showing a patient that performing excellent dentistry on them can be comfortable, painless and, yes, enjoyable or whether it is providing a high level, impactful learning experience for other dentists, it all feeds my soul. I think that is why I enjoy teaching so much. This is why being a Visiting Faculty member at Spear Education continues to be a very valuable experience. And it is why my wife, Julie, and I enjoy hosting courses in our town and related meals in our home- creating memorable experiences and impacting other’s lives is truly a special gift. So thank you Dr. Fahl and thanks to all the dentists who came from around the country to learn and share and grow. The road to being a Master Dentist takes many paths and I am truly enjoying mine!!! Wow, Rob!! What a fantastic review of our week in Baltimore. You are a passionate colleague about our profession. Always remember “learning is a life-long endeavor and it is not completed until it is passed on”. With Julie by your side, you have a winning team.